Just finished Week 2 of my first NaNoWriMo experience so I thought I’d update you on how things are going and some of the things that I’ve learned thus far. I’m on target with my word counts (right now I’m at 25221) and am just a little over halfway to “winning”. I’m actually enjoying what I’m writing (which goes a long way to making this easier) and have managed to not stress completely out in making my targets. I haven’t written every day but I have been really good at making up for it on days where I have more time. I tend to write when my wife isn’t home so I have about 1.5 to 2 hours when I get home from work to get some words in. I also write more on Wednesday nights (while she works the night shift) and Thursday mornings (before I go work the night shift at my library). I’ve found that I work better if I get out of the house…coffee shops and libraries are my friends (but I already knew that). I’ve also attended a write-in with some like-minded local folks. 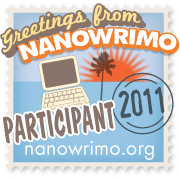 That’s been one aspect of the NaNoWriMo experience that’s surprised me…the socializing aspect. Everyone is so on-board with encouragement and positive reinforcement. That part is very refreshing in an online world where simple civility, much less encouragement, is a rare commodity. Plus, both in real-life and in online life I tend to be a bit of a wall-flower. Doing something as…intimate…to me as writing with strangers is a new experience for me and well outside of my comfort zone. But it has been good. I don’t do the “all-nighters” some of the younger folks are doing…I’m just too damn old, I guess…they don’t even appeal. But what socializing I have done has been great (thanks Kay Qy, kaliawai512, veleda0, Twin_Writer, ravenoak, Kacey3, DudgeOH, rhetoricteacher, Cid, and chaetrian). My biggest distractions have been work (damn you, capitalist economics!) and social networking. However, I have stopped playing my Facebook games cold-turkey (Mafia Wars, Farmville, YoVille, etc. )…and I don’t actually miss them very much. This is probably a good thing. Twitter is harder to ignore…especially as I’ve started following fellow NaNoWrimos. But, so far so good. I suspect that I’ll need more than 50,000 words to actually complete the novel. This shouldn’t come as a surprise as 50k actually makes for a very short novel these days. However, as (a) I’ve never written a single piece that was longer than about 5000 words and (b) I wasn’t even sure I could write the initial 50K on one project (and technically haven’t yet), the idea that I’ll need to make this piece even longer to complete it is kind of mind-blowing. I’m really enjoying the story though and I have ideas on how to expand it and make it better…and have trained my ninja attack kittehs to bite my hand if I go to try and edit anything I’ve already done. I know that a lot of what I’ve written will need to be revised, but I’m still pretty pleased with it. I really think that if I finish this and rework it enough, I may try to send it to an agent. But that will be months, maybe a couple of years, down the road. For now I’m just pleased that I’m rolling along at a good pace and am actually enjoying my first novel. If the final two weeks go as well as the first two weeks have, then I will definitely be participating in this again. I’ve place a widget on the right-side of the page to track my word count for the rest of the contest. Feel free to check back here to see how I’m doing.